This article was originally published on the 13th of September in Utility Week. "Privatisation of water has clearly failed, and regulation hasn’t helped"
This month, English water companies jumped at the opportunity provided by submitting their PR19 reports to show off their shiny new promises to customers. You can’t blame them - they’ve had a terrible year. Between the ‘Beast from the East’, the heatwave, and our sustained campaign for public ownership on the back of Labour’s manifesto policy, England’s private water companies could do with some good press. Unfortunately, they’re still in hot water (sorry). Pennon Group’s promise to make customers into shareholders has been ridiculed - given that the plan would give each household served by South West Water a grand total of £1.25 per year in profit. Thames Water has made a slightly miserable promise to keep bills about the same, while focusing on increasing investment in infrastructure. It’s about time too: Thames Water leaks millions of litres every day through broken pipes. And United Utilities - who outraged customers by threatening a hosepipe ban this summer, are attempting to make up the damage by reducing bills by 10.5%. Small change, given water bills have risen 40 per cent in real terms since privatisation. 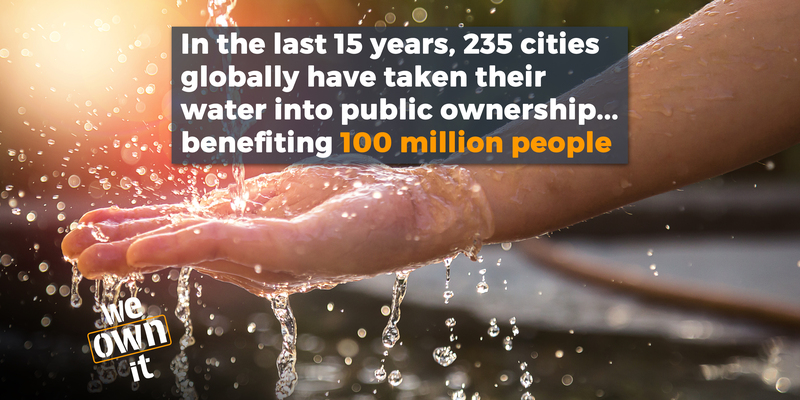 The water industry’s favourite statistic is that they’ve invested £150bn since water was privatised. That works out around £5bn per year. But total annual revenue from water bills is about £10-11bn. (1) So in fact, all of that £150bn of investment could have been covered by our bills every year. It certainly hasn’t been paid for by the private company shareholders: as the National Audit Office showed a couple of years ago, there has been roughly zero new shareholder equity invested since privatisation. And a new report shows that indeed our bills have covered all the operating costs, and all the capital expenditure, and all the debt interest, in every one of the 29 years since privatisation - with a small surplus every year. So what exactly have the private owners of English water companies done for us? Privatisation of water has clearly failed, and regulation hasn’t helped. Ofwat has failed to prevent ridiculously high levels of gearing and debt accumulation, immense and evidently unjustified dividends to shareholders, and bills rising far above inflation year after year. Customers have come last, again and again. These new plans may aim to fix some of the symptoms, but they don’t address the root cause. So how would public ownership be better? Let’s look to our contemporaries in Paris and Scotland. It sounds obvious but, if water companies weren’t handing over vast sums of money to shareholders, they could reinvest their profits: not just into improving infrastructure and services, but to reduce bills. Publicly owned Scottish Water now charges £42 less per household on average than English water companies, despite investing 35% more, and in Paris, water bills have reduced by 8% since the city brought water into public ownership in 2011. Despite constant complaints by customers, Ofwat, the Consumer Council for Water and the Environment Agency, England’s private water companies are wasting 20% of our water before it even reaches our homes. The explanation is simple - they just don’t have the right incentives to invest in fixing leaky pipes. Regulation clearly isn’t working. But in Paris, since bringing water into public ownership, they’ve brought leakage levels down to 5-10%. Private water companies are accountable to their shareholders. Some would argue that they’re accountable to Ofwat, but Ofwat has stood by for 30 years of financially, socially and environmentally irresponsible behaviour. If we followed the Paris model of public water, our regional water companies would be accountable to citizens, and we’d create regional water ‘Observatories’ with representatives of consumer associations, environmental organisations, workers and experts. Part of the success of L’Eau de Paris, Paris’ publicly owned water company, has come from its innovation. They’ve invested in a state of the art research facility to test water quality. They’ve installed plenty of free public toilets and drinking fountains around the city - including some which flow with sparkling water! How Parisian. They have social initiatives too - a solidarity fund to help people on low incomes pay their water bill, and a project to get access to clean water for rough sleepers. While Thames Water pays fine after record fine for pumping billions of litres of sewage into our rivers, Scottish Water has invested in so much renewable energy that it is now generating twice as much as it is using. Public ownership allows companies to make the environment a priority - rather than collateral damage. We won’t see the changes we need until water is brought into democratic, regional public ownership. No other country in the world has a water system like ours - and that’s because it doesn’t work. Privatisation has had its day. 83% of the public want water to be brought into public ownership, and our campaign (the first of its kind since the 80’s and 90’s) reflects that consensus. 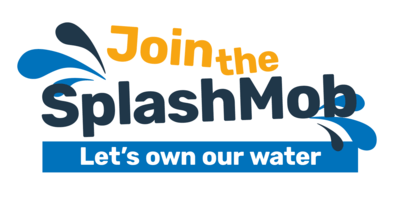 We’ve been working all summer to build our petition, make the case for public ownership, and create an alternative vision for water. We’re taking our water back.